When it comes to travel content marketing, there are those who might say Lonely Planet stands alone. The publisher has been producing must-read travel content for decades and its guidebooks can be found in the hands of curious travelers around the world. Therefore, it's no surprise companies want to partner with Lonely Planet to benefit from its excellent reputation and unrivaled expertise. We talked with Carla Pearse, Senior Vice President, Sales & Business Development at Lonely Planet about what Lonely Planet has learned, how data has changed what they do and more. How has partnering with brands benefited Lonely Planet and the brands themselves? How much of that effort has entailed producing new content specific to the partner versus relying on existing content? Partnering with other brands benefits Lonely Planet as we believe that travel creates meaningful experiences for everyone -- and we can share this with a wider audience through our partners. For those partners, it is a wonderful opportunity to leverage Lonely Planet's trusted brand, expertise and award-winning content to entice, inspire and bring credence to their own campaigns and objectives. We work closely with [our partners] to develop travel content in a variety of different forms tailored for their brand and customers, using innovative strategies that have proven to benefit both parties.While each partnership requires a unique approach, we find most projects tend to be a blend of new and existing content. At the end of the day our goal is to provide the end-consumer with the best experience possible, which will yield more meaningful results for our partners. What are some successes you've had in the partnership realm and how did content help you achieve the goals? We have had many success stories throughout the years. One of the most successful partnerships is our 5-year relationship with the Beaches of Fort Myers and Sanibel. Together we have developed an effective and relevant visitor's guide that helps them market every part of their destination. 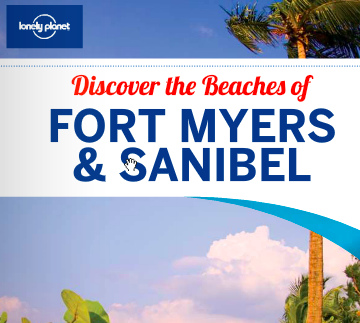 Lonely Planet's partnership with The Beaches of Fort Myers and Sanibel has had tangible benefits for both destinations. In a study performed by their agency MMGY, up to 8% of those who were sent the guide (and were previously undecided about travel to the region) said that they visited Fort Myers as a direct result of the guide. Furthermore an average of 39% of those who read our guide to the area visited within 4 months and 2% of those reading the guide while in the region extended their stay. For many of our partners, we know their number one priority is to have consumers take action and book their trip. We've been doing that as a brand for more than 40 years. Has the way you produce content changed with the rise of more in-depth and instantaneous data? Lonely Planet has in-depth coverage on more than 29,000 destinations around the world. The trick is making that scalable in a digital age. We now commission, produce and manage our travel content with a platform-agnostic mindset, it’s no longer with the printed guidebook forefront in our minds. This way we can provide content for all our different channels efficiently and make sure the freshest information is available as soon as possible. The travel industry seems to have embraced using content faster and more adeptly than some other industries, what do you think accounts for that? You cannot market a destination (or getting to that destination, or staying in that destination) without content. In order to have a consumer consider a destination, you need to tell them what's special about it by showcasing one-of-a-kind experiences via images, video and other platforms. To picture oneself in a destination and paint a picture of that experience, there needs to be content behind it. When marketing Lonely Planet content, do you see a greater deal of success in social vs. paid vs. owned media or is it a mix? It's a mix of paid, owned and earned channels. We have a paid media budget and use this strategically to help us reach new targeted audiences. But mostly, we invest a lot in creating inspiring, enriching and helpful content for travelers which enables us to achieve distribution through our earned channels. We have crack PR teams in each region that are incredibly successful in getting us global media coverage of our brand, marketing campaigns and content. Social is also a major facet of our distribution strategy, allowing us to reach our community of over 6 million fans and followers who are eager to share our content with their networks as well. Which other travel companies do the best job of creating compelling content? Is there anything unifying about those? I think the one unifying piece is that no one travel industry has gotten it quite right. To create content that is meaningful, with an editorial voice and at scale is costly and complicated. I believe many companies struggle between licensing content that lacks voice and investing to create a voice of their own. There are some companies like Jetsetter that have begun to develop that voice and identity, but they are smaller scale. In my experience, it seems that it's difficult for airlines, hotels, cruise lines, etc. to justify the cost for meaningful content because it is hard to prove return on investment. Budgets can always be spent on other initiatives that have a clear ROI. In many cases, content is viewed as a nice to have and not a necessity. I think this is why I have yet to see any one brand (outside of content providers themselves) be able to do it well and at scale. This is how we excel at working with partners. We provide them with quality content solutions with a voice that fits within their own brand goals. How can smaller players in the travel space stand out with content despite limited resources? It is really important for smaller players to first understand their identity and then think of how content can be an extension of that identity. Once that is established, hire an editor that understands the vision to shape your content strategy and rely on your staff to help develop the content itself. I suggest working with your employees in this way as so many staffers are passionate about the travel companies they work for and are already brand ambassadors. When they are able to contribute advice or insights, it boosts morale. It will also help to develop content that is original, which increases SEO. And of course, if creating content internally is not an option, you can partner with a larger content brand, like Lonely Planet, to bring their expertise to your organization. Our business development team is experienced in working with companies to find marketing solutions by leveraging our content, brand and passionate audience.